Last month I touched on a recruiting topic that I decided to expand upon in this article. 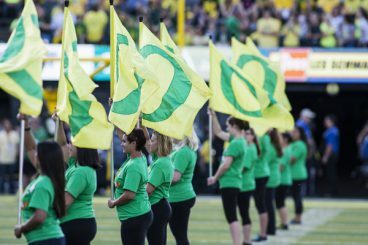 I stated that “the success of Oregon does not come from a big group of the highest-rated prospects.” Oregon’s success is unlike many programs that find success on the field only when their recruiting has success. The ‘O’ is for overachieving. Oregon is known for signing athletes who fit the system with speed, intelligence and potential. Speed and intelligence can’t be coached but can be funneled into positive, efficient game-playing success. Potential is observed by savvy, hard-working coaches who know how to transform a mediocre player into a good player, or a good player into a great player. These kinds of coaches know how to bring out the best with lesser-talented athletes. This has been the recipe of success for the Ducks over the past several years. This recipe continues to work; nevertheless, it can take the Ducks only so far. 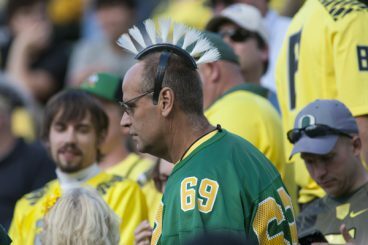 In the conference, Oregon is always out-recruited by USC, but the Ducks seem to perform better on the field than the Trojans. In recent years, with superstars peppered throughout the Trojans’ starting lineup and backup rosters, they continue to underachieve by accomplishing less with more talent. The Ducks, on the other hand, do more with less, consistently. There is a study that has been brought to my attention that shows an evolution of Ken Massey‘s statistical system of rating sports teams and tweaking it to measure a team’s success based on strength of schedule and win-loss record. A Harvard PhD candidate, Stephen Pettigrew, alters the Massey score by using recruiting averages between 2005 and 2014. Fans worship the elite players who come to Oregon. The statistical calculations demonstrate a very interesting outcome. The graph shows which programs have consistently overachieved in the last decade based on the level of recruiting. Not surprisingly, Oregon is at the very top behind only Wisconsin. Actually, this may surprise many because there is this perception that Oregon is a top recruiting machine. On the contrary, Oregon isn’t adept in recruiting more 4- or 5-star prospects than the 3- or fewer-star guys each year. So, when Oregon wins 10 or more games each season, it speaks volumes about the quality of its program. On the most extreme end of the spectrum lies Alabama recruiting, having the No. 1 class for several years. The last time the Tide did not bring the recruiting title home was 2010, with the No. 5 class. In ’09 Alabama had the No. 2 class and in ’08 it had the No. 3 recruiting class. Oregon brought in four 5-star studs from 2008 to 2014 while Alabama snagged a “measly” 27 5-star athletes from high school. That is a huge discrepancy between the two programs. This is why Alabama has won three titles in that period while Oregon has played for only two. Is there a direct correlation? With so many Top-5 recruiting classes in a row, you would think Alabama should have all the national titles in that span of time. Why wouldn’t it? If a team stock-piles top talent every year it would make perfect sense to expect undefeated seasons every year. With the top-paid coaches in the nation and best athletes nationwide, Alabama should never lose a single game. That is my expectation and I’m not even a big Tide fan; however, Alabama finds a way to lose at least one game each year. How does that happen? Ugo Amadi is a high talent taken from LSU who sees time on the field as a freshman. Funniest thing is, there are elite athletes everywhere lining up to sign with Alabama to be a back-up and ultimately underachieve the team’s potential. How sad! Then I look at Oregon, who signs a single 5-star blue-chip occasionally and yet consistently overachieves. Am I the only one who has noticed this significant phenomenon? It sure seems that the top athletes would take notice and would line up to play for Oregon instead. Justin Hopkins from 247sports.com just shared a similar Massey/Pettigrew list of 50 teams that have the top talent according to 247sports’ composite rankings. This is derived from ranking each of the current 85 scholarship athletes on each team. The Top 5 in order are Alabama, USC, Ohio State, Florida State and LSU. Oregon ranks at No.17 on this list. Hopkins refers to Barton Simmons’ article describing what this list is and why we need it, and what we learn from it. Hopkins then ends his article with a link to Steve Wiltfong‘s analysis of who is overachieving. Of course, Wiltfong observed that Oregon is right at the top of the overachieving end. This is a great time to inform those great prospects who plan on making an official visit to Oregon, especially those who will be in attendance this weekend for the Utah game. Five of the six confirmed visitors are not committed yet. Each of those five prospects plays on the defensive side of the ball where there is great need for solid depth. Three defensive ends making the trip are Rahshaun Smith from Florida, Bryson Young from California and recently-announced Prince Sammons from Ohio. Getting a verbal commitment from any one or more of these 4-star guys will definitely help bolster the D-line needs. Two more athletes traveling from really far away are linebackers Michael Divinity from Louisiana and Aaron Hansford from D.C. Both are great players; however, Divinity’s speed makes him stand out. He would fit perfectly in Oregon. 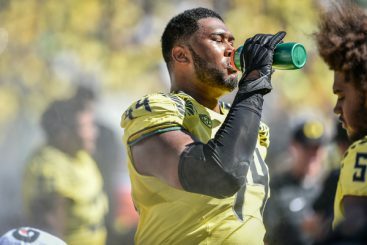 DeForest Buckner is a defensive lineman who will leave a huge void after this season. 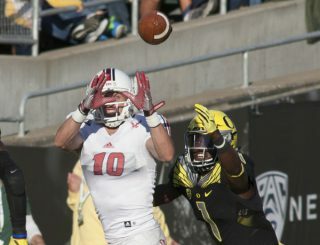 So far, Oregon will host nine official visitors for the Oct. 10 game against WSU. Caleb Kelly is one. The linebacker will have great company chatting with five committed prospects about the future with Oregon. 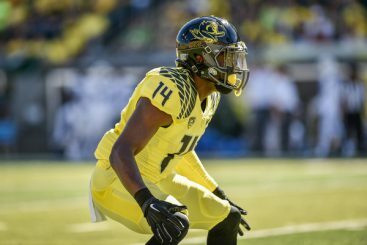 Kelly is one of those talents that would make an immediate impact at Oregon to be the next superstar and not get lost in the shadows of other elite players. Overachieving is just the norm at Oregon, but with higher levels of talent that will be developed by amazing coaches to help student-athletes prepare for the NFL, national championships will begin to land in Eugene. There are several elite prospects with offers from Oregon who have yet to commit. Gregory Little, a monster offensive tackle who plays on the same team as current commit Seth Green; Devin Asiasi, a defensive end that has endless upside; Connor Murphy, of whom I have been a fan of for quite some time and who has the power to play anywhere on the defensive line. Rashard Lawrence is an explosive defensive tackle who should reconsider Oregon as a destination; Brenden Ferns, an inside linebacker who won’t find any room in his home state at Ohio State; Lyndell Wilson, who would also get lost among too much talent in his home state of Alabama. Brandon Jones is a safety who would be the most exciting player from Texas to play at Oregon since LaMichael James; and the two Nigels — Knott, a cornerback who has SEC defensive coordinators frothing at the mouth, and Warrior, a safety from Florida who would thrive at Oregon. Landing a few of these young men would certainly make an impact as soon as Fall 2016 at Oregon. Too many passing yards on this young defensive backfield can be cured with elite depth. 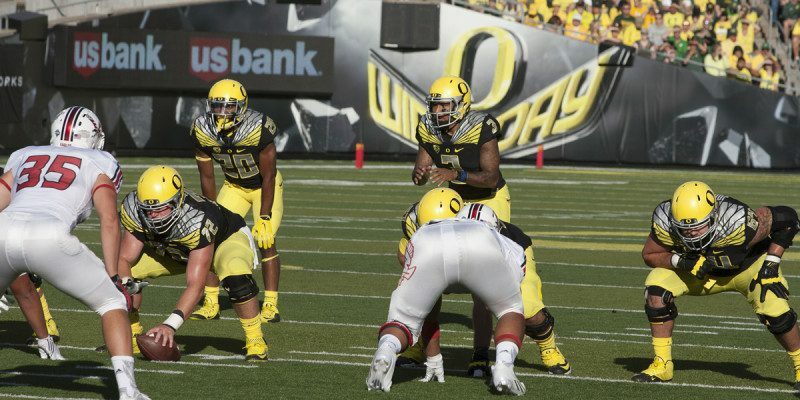 The Ducks would love to flip a couple of elite athletes within the four months left until signing day. A few of these may steer their interest to Eugene based on what’s going on with their current program they have committed to. The two USC guys are defensive tackle Keyshon Camp and linebacker Mique Juarez. The unacceptable conduct in the USC locker room recently has some suspecting that the Trojans forgot it’s a team sport. Jake Heinrich is an offensive guard from Iowa whose early commitment to Arkansas seems a little hasty. The Razorbacks started off as a preseason No. 18 team and have won only their first game against a non-conference foe. Being outside of the Top 25 before starting conference games doesn’t bode well. Isn’t Arkansas about the same distance from Iowa as it is from Oregon? Finally, a defensive tackle I’m not giving up on is Georgia native Julian Rochester, who attends the same high school as the Griffin brothers did. Rochester is quick, strong and disruptive in the backfield of opposing offenses. Rochester is currently committed to Georgia. The Bulldogs are great, but so is their depth at DT. There’s a ton of talent projected to be in Athens next fall. If there is an elite athlete out there riding the fence between Oregon and some high-recruiting team with deep roots of great football tradition and history, he needs to figure out his own destiny. The stats prove that Alabama has consistently underachieved each year it doesn’t win a national title. It is a team with a foundation of success based on 4 and 5-star recruits. Also take note that the 3- and 4-star talent foundation never should have gotten Oregon to any championship game or a 10-win season, ever. Yet here are the Ducks, consistently in national title talks, and they don’t appear to be slipping down any time soon. Special thanks to Duck Territory at 247sports.com for sharing this information withFishDuck.com. Check out their trial subscriptions for the best up-to-date daily information on Oregon recruiting.